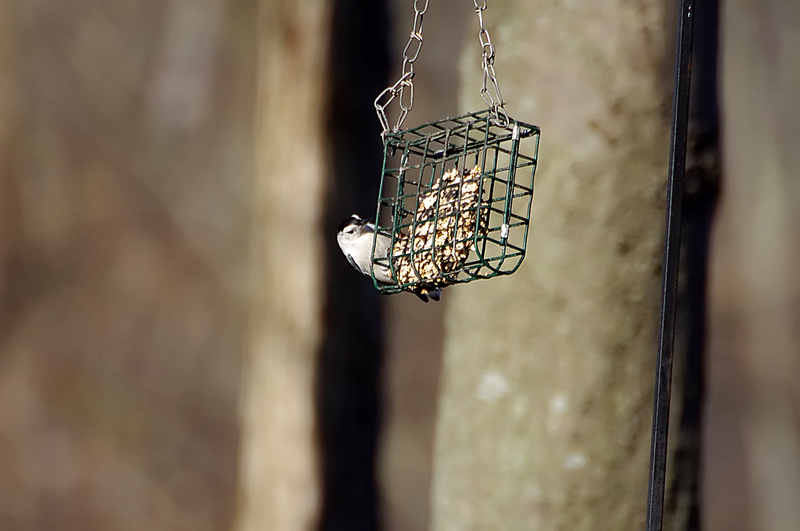 A common feeder bird with clean black, gray, and white markings, White-breasted Nuthatches are active, agile little birds with an appetite for insects and large, meaty seeds. They get their common name from their habit of jamming large nuts and acorns into tree bark, then whacking them with their sharp bill to "hatch" out the seed from the inside. White-breasted Nuthatches may be small but their voices are loud, and often their insistent nasal yammering will lead you right to them. 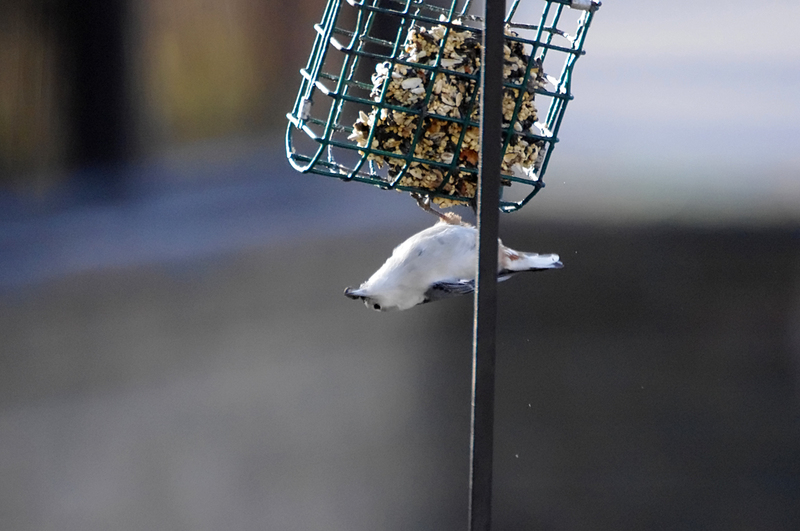 The White-breasted Nuthatch is normally territorial throughout the year, with pairs staying together. The male has to spend more time looking out for predators when he's alone than while he's with his mate. That's the pattern for most birds, and one reason why birds spend so much time in flocks. But the female nuthatch has to put up with the male pushing her aside from foraging sites, so she spends more time looking around (for him) when he's around than when she is alone. 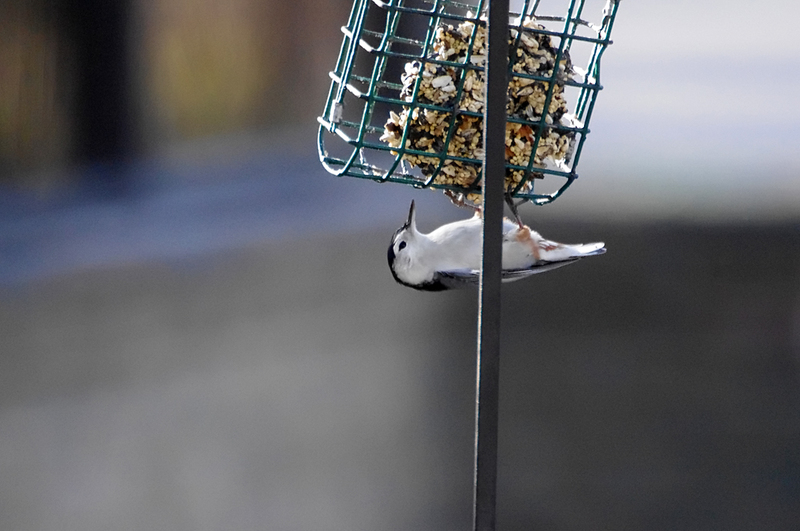 In winter, White-breasted Nuthatches join foraging flocks led by chickadees or titmice, perhaps partly because it makes food easier to find and partly because more birds can keep an eye out for predators. 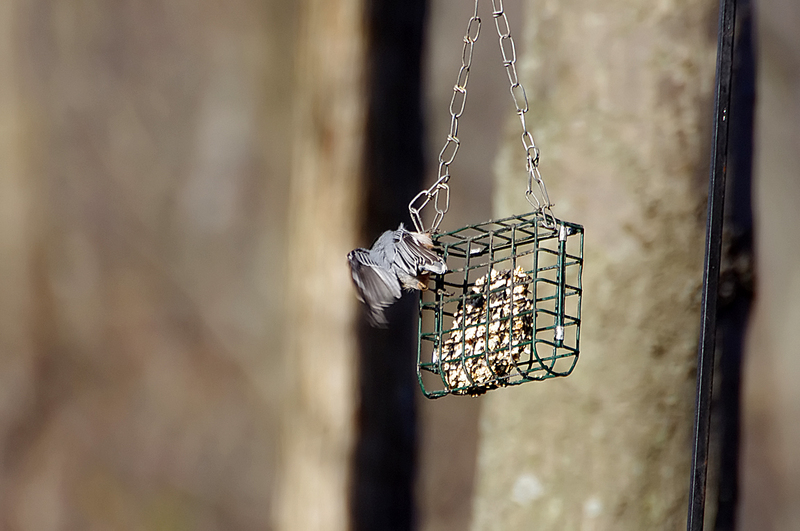 One study found that when titmice were removed from a flock, nuthatches were more wary and less willing to visit exposed bird feeders. 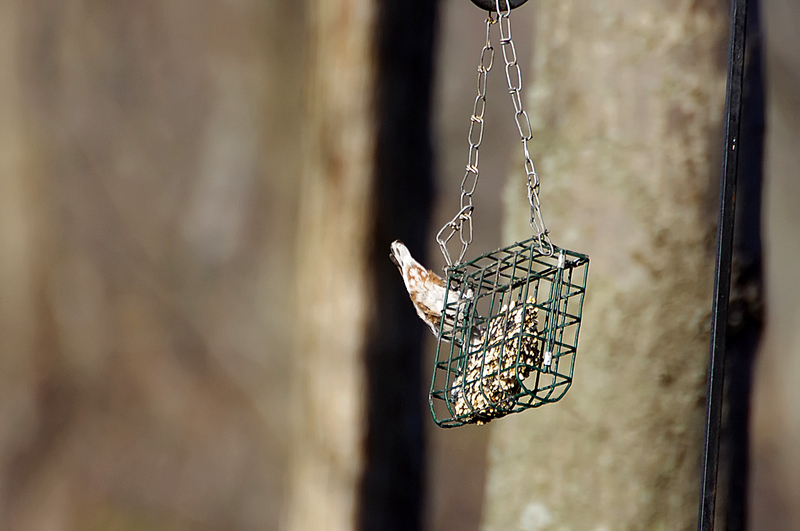 If you see a White-breasted Nuthatch making lots of quick trips to and from your feeder - too many for it to be eating them all - it may be storing the seeds for later in the winter, by wedging them into furrows in the bark of nearby trees. 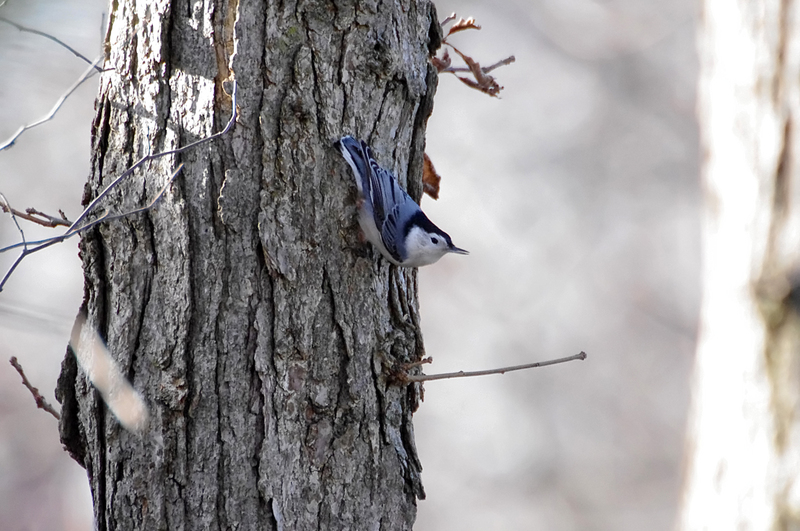 The oldest known White-breasted Nuthatch was 9 years 10 months old. 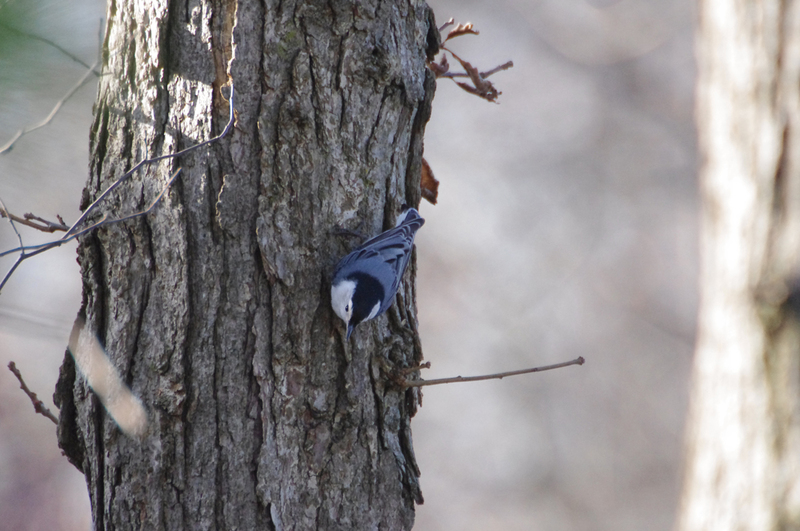 The largest nuthatch, this is still a small bird with a large head and almost no neck. 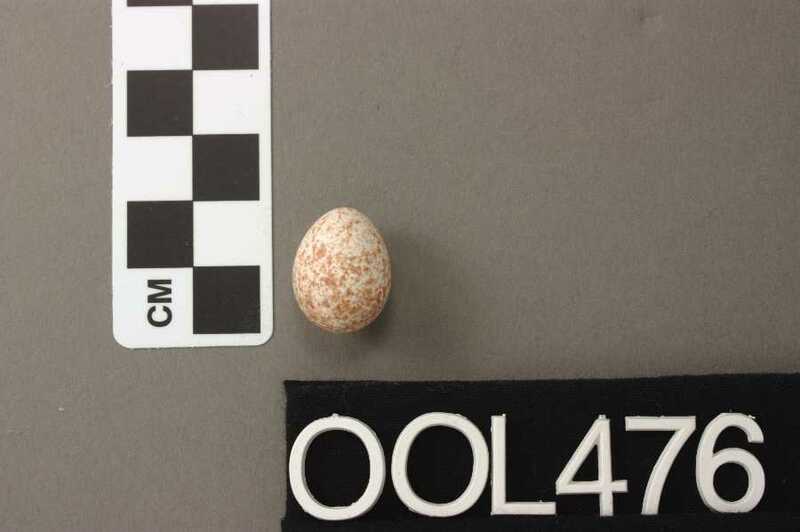 The tail is very short, and the long, narrow bill is straight or slightly upturned. White-breasted Nuthatches are gray-blue on the back, with a frosty white face and underparts. The black or gray cap and neck frame the face and make it look like this bird is wearing a hood. The lower belly and under the tail are often chestnut. 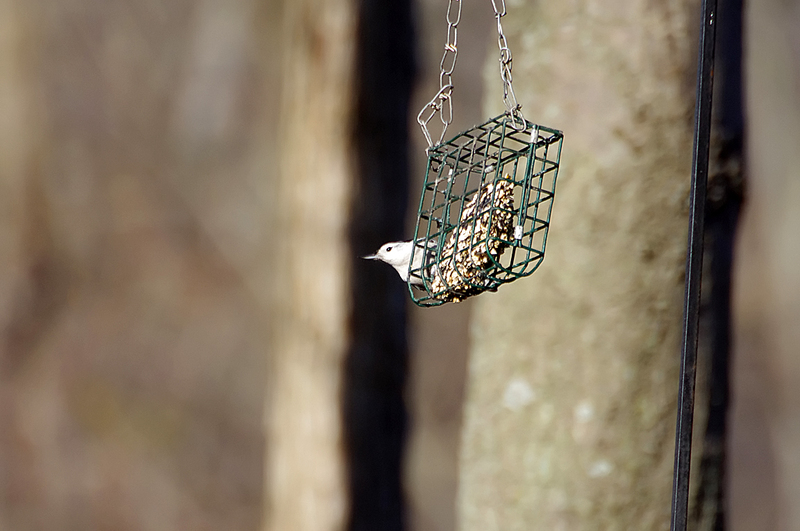 White-breasted Nuthatches are birds of mature woods and woodland edges. They're particularly associated with deciduous stands, including maple, hickory, basswood, and oak, though they can be found in some coniferous forests. 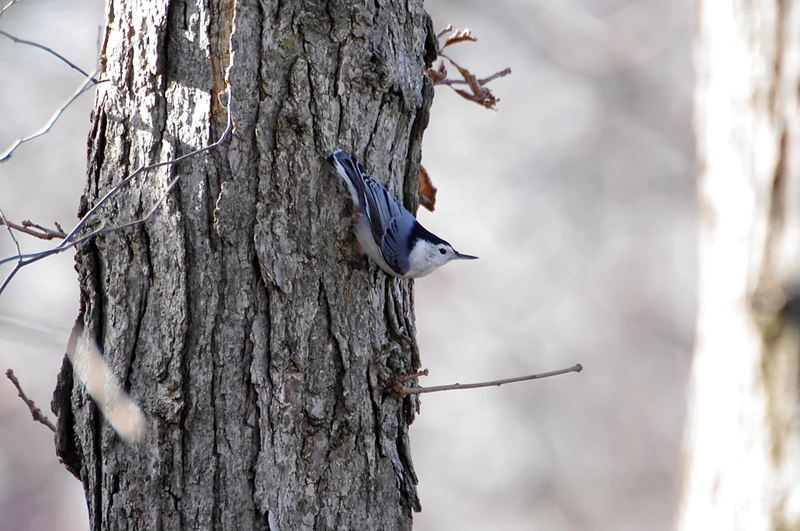 White-breasted Nuthatches are agile birds that creep along trunks and large branches, probing into bark furrows with their straight, pointed bills. 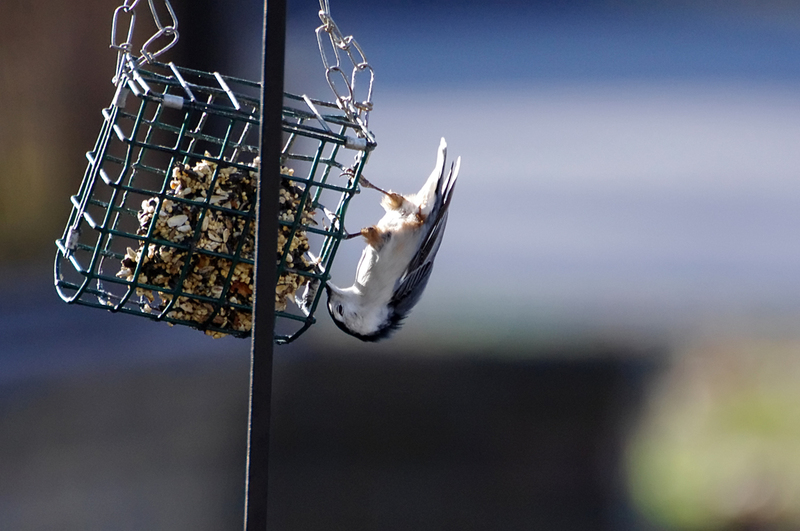 Like other nuthatches, they often turn sideways and upside down on vertical surfaces as they forage. They don't lean against their tails the way woodpeckers do. 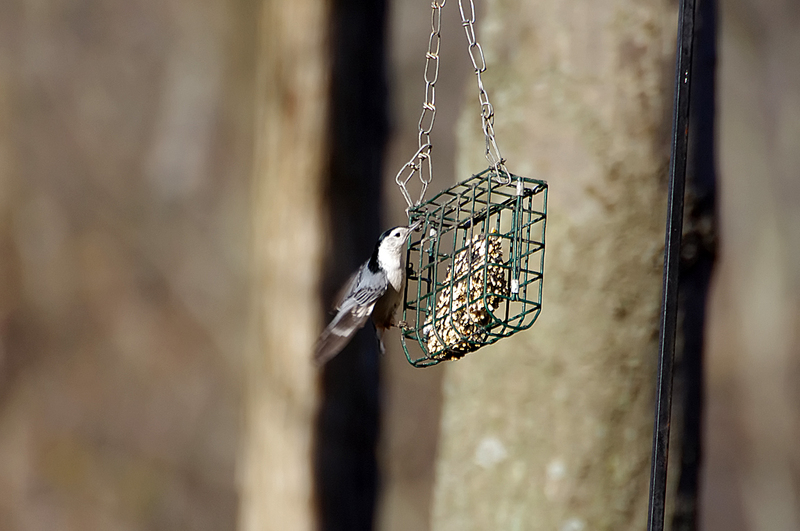 White-breasted Nuthatches eat mainly insects, including weevil larvae, wood-boring beetle larvae, other beetles, tree hoppers, scale insects, ants, gall fly larvae, caterpillars (including gypsy moths and tent caterpillars), stinkbugs, and click beetles, as well as spiders. 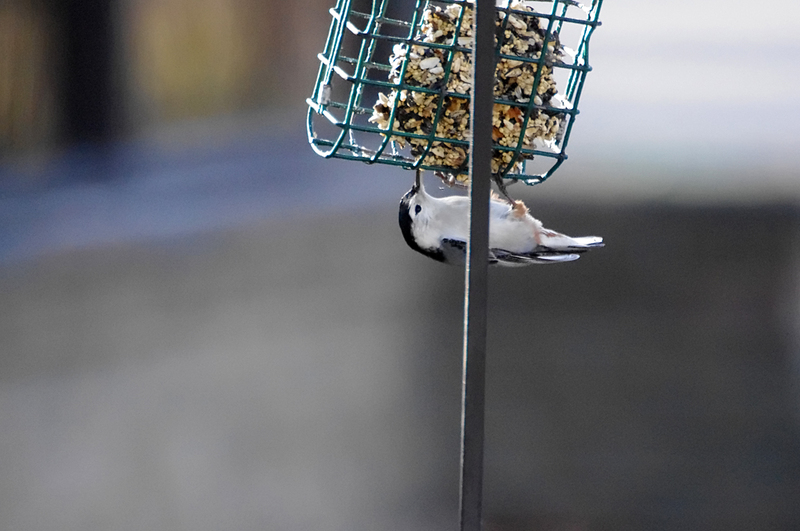 They also eat seeds and nuts, including acorns, hawthorn, sunflower seeds, and sometimes crops such as corn. 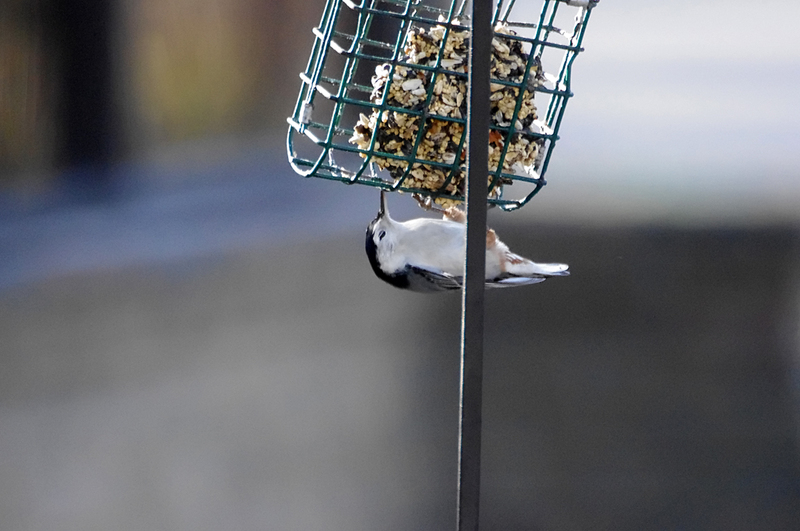 At birdfeeders they eat sunflower seeds, peanuts, suet, and peanut butter. 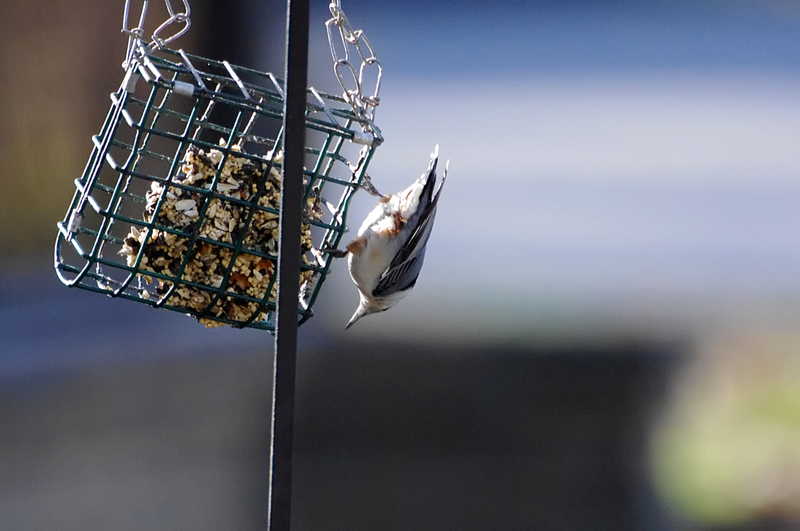 The White-breasted Nuthatch's most common call is a loud, nasal yank often repeated a few times in a row. Both sexes make this call, and it often has a more trembling, almost bleating quality, than either the bird's song or the Red-breasted Nuthatch's call. When looking for food, males and females exchange a soft yink. Dunne, P. 2006. Pete Dunne's essential field guide companion. Houghton Mifflin, Boston. Ehrlich, P. R., D. S. Dobkin, and D. Wheye. 1988. The birder's handbook. Simon & Schuster Inc., New York. Sibley, D.A. 2000. 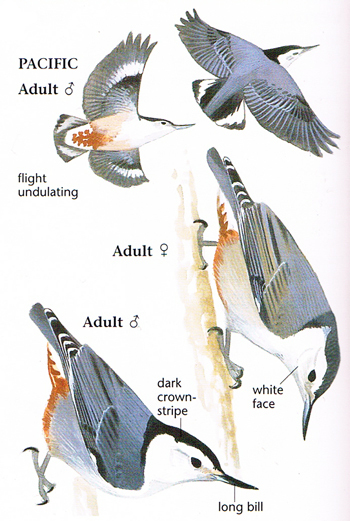 The Sibley guide to birds. Alfred A Knopf, New York.